CIO Robin Hepworth discusses the long term investment opportunity presented by Asia. Whilst Head of SRI Neville White outlines how a responsible investment approach can reduce risk when investing in Asian equities. Lydia Greasley, Investment Analyst at EdenTree, takes us through the latest Amity Insight to be published by EdenTree. The Life Code takes a look at the companies and technologies on the cutting edge of medical science, and the ethical issues this raises. 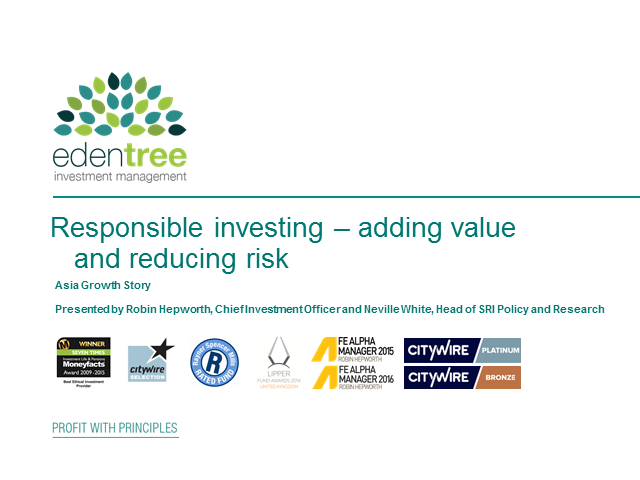 How do EdenTree, as a responsible and sustainable investor, respond to these whilst capitalising on the opportunity this growing area affords? Esmé van Herwijnen, Responsible Investment Analyst at EdenTree Investment Management, takes us through EdenTree's latest piece of Amity Insight research, which explores the issue of waste from the perspective of a responsible and sustainable investor, looking at how our economic model has led to the depletion of resources and an exponential increase in waste production. Neville White, Head of SRI Policy & Research at EdenTree, talks about our latest Amity Insight: Hungry Planet Revisited. A sister publication to our previous Amity Insight: Thirsty Planet Revisited, Hungry Planet explores the risks, challenges and opportunities related to the global food supply chain and a rising population. As well as examining these issues, we will look at the investment value chain via five 'investible themes'. Following the publication of EdenTree's latest Amity Insight, author Esmé Van Herwijnen examines the challenges facing the world's cities and asks what it will take to make the cities of the future sustainable. As well as looking deeper into these issues, Esmé also discusses the investment value chain that can be found in the sectors which serve as integral to keeping cities moving – these are sectors in which the EdenTree range of Amity Funds are well represented, and we hope that you will be interested to learn more about the companies held in our funds which are at the forefront of developing solutions for the sustainable city. Neville White, Head of SRI Policy & Research at EdenTree, talks about our latest Amity Insight: Thirsty Planet Revisited, which looks at water risk and and opportunities for responsible investors in the $600bn global water sector. Co-fund manager David Katimbo-Mugwanya goes through the objectives and portfolio make up of the new fund. David also discusses the investment case and portfolio summary. Neville White, Head of SRI Policy & Research at EdenTree, presents on the latest Amity Insight available from EdenTree. Looking at the future of work, including the gig economy and the rise of automation, Neville discusses the issues for responsible investors and the wider social implications over the long term. A fund update with senior fund manager Chris Hiorns. Chris will be going through recent performance and his outlook for the market. An overview of the UK Equity Growth Fund. An overview of the Higher Income Fund. An overview of the Amity UK Fund. An overview of the Amity Sterling Bond Fund. An overview of the Amity International Fund. An overview of the Amity Global Equity Income Fund for Charites. An overview of the Amity European Fund. An overview of the Amity Balanced Fund for Charities.